(732) 521-1108DOWNLOAD OUR BROCHURE WITH MENUS AND PRICING! Sir Ives Corporate Caterers makes you and your company look deliciously polished and professional. 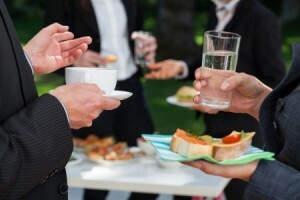 Sir Ives Caterers has been working with New Jersey corporations and small businesses since the 1980’s and we know what it takes to impress your employees, clients and guests while successfully communicating your corporate messaging goals. From professional development events held at your place of business or corporate conference center that runs from 7 a.m. until well into the evening, to company-wide summer picnics for hundreds of employees, we have done it all, and done it successfully. We cater professional development events held at your place of business, corporate conference center seminars and company-wide summer picnics for hundreds of employees. Sir Ives has done it all, with marked success. See Our Brochure and Menus for NJ Corporate Event catering by clicking here. Copyright © 2016 ~ Sir Ives Catering Co. Inc.